Size - Height at the withers - Males, 20 to 23 inches. The ideal is 22 inches. Females, 17 to 21 inches. The ideal is 19 inches. Weight - For males, 42 to 60 pounds; for females, 35 to 50 pounds. Proportion - Off square; slightly longer than tall when measured from prosternum to rearmost point of the buttocks, and from withers to ground. Substance - Strong, substantial bone; well developed, neither refined nor coarse, and a solidly built, muscular body. An essential characteristic; distinctively large, well proportioned and with exceptional breadth of topskull. Expression - Steady, penetrating, and attentive. Eyes - Medium in size; set well apart, and a bit obliquely. Roundish and neither prominent nor sunken. Black or various tones of brown in color. Darker eyes are preferred. Eye rims fully pigmented with black edges in black, black and white, or white dogs; brown edges in brown dogs. Haws are dark and not apparent. Ears - Set well above the line of the eye. Leather is heart shaped and thin. Except for a small opening at the back, ears are held nicely against the head. Tips should not reach below the lower jaw. Skull - In profile, it is slightly longer than the muzzle, its curvature more accentuated at the back than in the front. When viewed head-on, the top of the skull is very broad and appears domed, with a slight depression in the middle. The forehead is prominent, and has a central furrow, extending two-thirds of the distance from stop to occiput. The occiput is well defined. Stop - Well defined. Muzzle - Substantial; wider at the base than at the nose. JawsStrong and neither over nor undershot. Nose - Broad, well flared nostrils. Fully pigmented; black in dogs with black, black and white, or white coats; various tones of brown in dogs with brown coats. Lips - Thick, especially in front; no flew. Lips and mucous membranes of the roof of the mouth, under tongue, and gums are quite black, or well ticked with black in dogs with black, black and white, or white coats; various tones of brown in dogs with brown coats. Bite - Scissors or level. Teeth - Not visible when the mouth is closed. Canines strongly developed. Neck - Straight, short, round, and held high. Strongly muscled. No dewlap. Topline - Level and firm. Body - Chest is broad and deep, reaching down to the elbow. Ribs are long and well-sprung to provide optimum lung capacity. Abdomen well held up in a graceful line. Back is broad and well muscled. Loin is short and meets the croup smoothly. Croup is well formed and only slightly inclined with hip bones hardly apparent. Tail - Not docked; thick at the base and tapering; set on slightly below the line of the back; should not reach below the hock. When the dog is attentive the tail is held in a ring, the front of which should not reach forward of the loin. The tail is of great help when swimming and diving. Shoulders are well inclined and very strongly muscled. Upper arms are strong. Forelegs are strong and straight with long, well muscled forearms. Carpus is heavyboned, wider in front than at the side. Pasterns are long and strong. Dewclaws may be removed. Feet are round and rather flat. Toes neither knuckled up nor too long. Webbing between the toes is of soft skin, well covered with hair, and reaches the toe tips. Central pad is very thick, others normal. Nails held up slightly off the ground. Black, brown, white, and striped nails are allowed. Wavy - Falling gently in waves, not curls, and with a slight sheen. No preference will be given to coat type, either curly or wavy. 1. Temperament - Shy, vicious, or unsound behavior. 2. Head - Unimpressive; small in overall size; narrow in topskull; snipey in muzzle. 3. Substance - Light or refined in bone; lacking in muscle. 4. Coat - Sparse; naturally short, close-lying hair, partially or over all; wispy or wiry in texture; brittle; double-coated. 5. Tail - Other than as described. Extremely low set. Heavy or droopy in action. 6. Pigment - Any deviation from described pigmentation; other than black or various tones of brown eye color; pink or partial pigmentation in nose, lips, eyes, or eye rims. 7. Bite - Overshot or undershot. Click Here to Learn about breeder background checks on Portuguese Water Dog breeders if you are looking for Portuguese Water Dog puppies for sale. Click Here to learn how ResearchBreeder.com can help you find healthy Portuguese Water Dog puppies for sale.Portuguese Water Dog puppies for sale. Click Here to order a Breeder or Kennel Background Check on Portuguese Water Dog Breeders that may have Portuguese Water Dog puppies for sale. 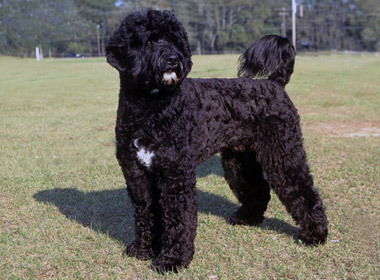 Click here to find the national breed club for Portuguese Water Dog puppies for sale. Click Here to purchase a list of approved ResearchBreeder.com Portuguese Water Dog Breeders who have Portuguese Water Dog puppies for sale.